Let’s talk about nutrition. Science has identified 118 nutrients that are used at some time for human health. No one knows with certainty how much of each of these your body actually needs, whether some nutrients perform multiple functions, or whether different combinations of nutrients can accomplish the same functions as other combinations of nutrients. But since food supplies differ throughout the world, it would seem logical that the body can adapt to whatever nutrients are available to it. For example, in cold climates where grains are not as readily available, the liver can manufacture glucose from animal proteins and fats rather than from carbohydrate. Nevertheless I always suggest eating a wide variety of foods to ensure you have the opportunity to ingest as many of these nutrients as possible. Sadly, Americans eat less than 20% of the recommended intake of vegetables, missing out on so many of the nutrition they hold. 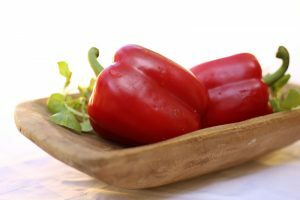 This week I am reposting a recipe, Stuffed Red Bell Peppers, to encourage you to include eating your vegetables not as a side dish, but as the star. According to WebMD, “Peppers have a lot going for them. They’re low in calories and are loaded with good nutrition. 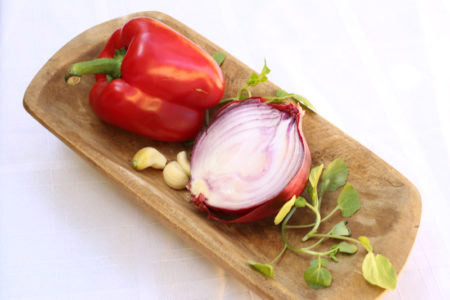 All varieties are excellent sources of vitamins A and C, potassium, folic acid, and fiber. Plus, the spicy ones liven up bland food, making it more satisfying. This recipe is easy and quick to make (you don’t need to have much of a chef’s background to prepare this one), and it is delicious. 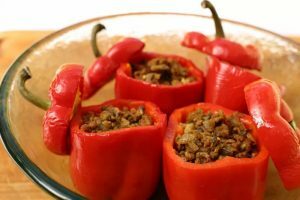 If you don’t eat meat, you can stuff the peppers with a vegetarian mix of your choice, such as mushrooms, celery, onion, leeks, and other vegetables you love. Sautee the onion and garlic in oil. Add mushroom cut into small pieces. Cook for 10 minutes. Add ground meat and cook until browned, approximately 10 minutes. Add tomato paste & seasonings and cook for 5 more minutes. 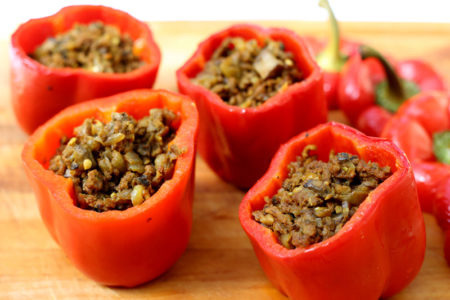 Remove ribs and seeds from green peppers and stuff each one with the meat and mushroom mix. Baste with olive oil and bake at 375 degrees for 35 minutes.